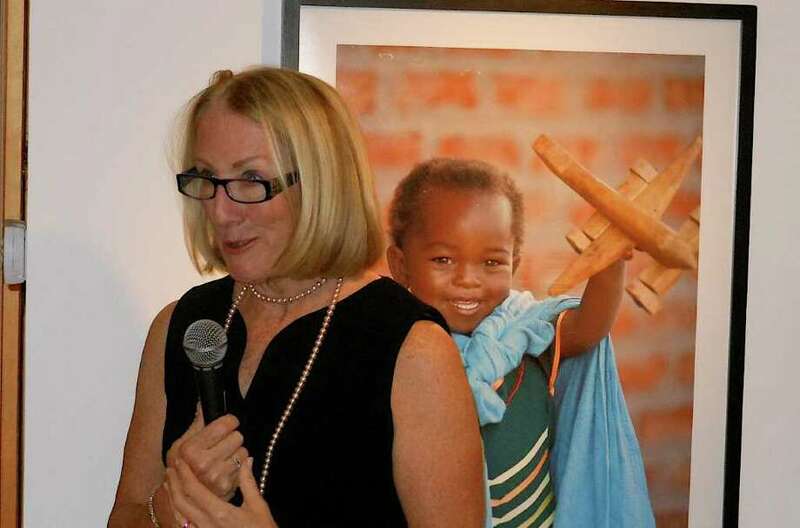 Anne Mulcahy, former Xerox CEO and Save the Children board chairwoman, addresses Westport Arts Center exhibit Friday of art work by Malawian children in Save the Children's HEART program. There was a lot of love at Westport Arts Center on Friday as local supporters and Save the Children staff came together to admire artwork by Malawian children participating in the non-profit's Healing and Education through the Arts (HEART) program. More than two dozen pieces of art, under the banner "Malawi with Love," were on display at the center. The Malawian artists, ranging from 11 to 14 years old, live in an African nation that has one of the world's highest rates of HIV/AIDS -- nearly one million children have lost one or both of their parents from that to illness. HEART, which also serves Nepal, Mozambique and Haiti, gives children the opportunity to engage in arts activities allowing them to express feelings and improve the quality of their education. Besides the colorful paintings, the highlight of the evening was the featured speakers, which included former Xerox CEO Anne Mulcahy, the board chairwoman of Westport-based Save the Children; Save the Children President and CEO Carolyn Miles; Westport Arts Center's exhibit curator Helen Klisser During, and WAC Executive Director Peter Van Heerden. Mulcahy called Save the Children, headquartered nearby at 54 Wilton Road, "extraordinary," citing the agency as the "leading independent organization for impoverished children." Save the Children, she added, "serves over 120 communities around the world and, while I'm a newcomer to the organization, I've seen its amazing impact, ensuring children's protection from exploitation and giving them access to health care and education." About the arts component of the project, Mulcahy said, "Art can communicate in ways that words can never do. When kids grow up in an environment of violence and AIDS, art becomes a healing therapy. I've been to Haiti over the last couple of years and seen HEART in action. My first visit was days after the devastating earthquake. I saw the kids with nothing but challenges and the impact of art was hard to describe." To the crowd's delight, Mulcahy announced that the HEART program is expanding to Japan, where children are struggling in the aftermath of a devastating earthquake and tsunami. Miles expanded on the program's mission, saying that it "helps kids mentally who have been traumatized by what's happened to them" and puts them in touch with materials -- crayons, paper, paint -- that they likely have not experienced before. Miles added that HEART currently reaches 8,000 youngsters, with 75 programs in Malawi alone. Miles pointed out one example of how art can be a healer. "In Haiti, we hiked up a hill to a school in the middle of complete devastation," she said. "While the school was intact structurally, the kids were afraid to go inside. So we set up a tent beside it and held school there. One little boy, Jaime, drew a picture of himself with his arms up, a little circle for a mouth and bubbles coming from the mouth. He explained that, when the earthquake came, he tried to scream, but nothing came out." Klisser During encouraged the gathering said it was a great privilege for the arts center to work with Save the Children. Of the Malawian children, she added, "Their pulse is heard loud and clear at Westport Arts Center, and hopefully you'll take some steps to make a difference." For his part, Van Heerden pointed out it was "a luxury for us to gather like this and celebrate." For information about Save the Children's HEART program, visit www.SavetheChildren.org or call 203-221-4000. The Malawi with Love exhibit is on display at the Westport Arts Center, 51 Riverside Ave., through Sunday.